For media inquiries, speaking engagements or advertising and sponsorship opportunities on ScriptPhD.com, please contact Jovana Grbić, PhD via email. Jovana J. Grbić was profiled in an editorial piece called “Scripted Science” by the Chemical Heritage Foundation Journal. Click on picture for a full PDF download. 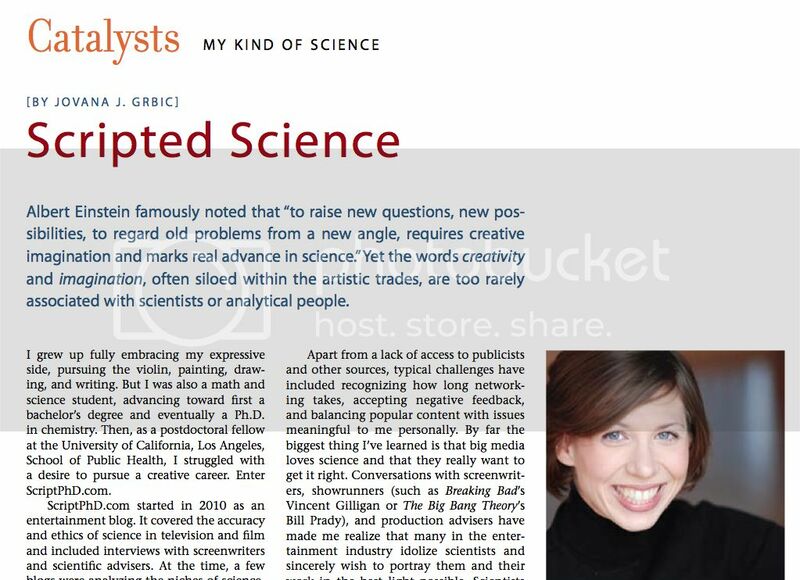 Jovana Grbic writes about her transition from bench science to creative and freelance writing in this essay for the Chemical Heritage Foundation Magazine. For a full PDF download, click on the link. ScriptPhD.com Editor Jovana J. Grbić was quoted and profiled in a recent Philadelphia Inquirer article on the rise of geek girl culture on television. Read the full article here. ScriptPhD.com Editor Jovana J. Grbić was quoted in a CNN article about the renewal of the television series ‘Fringe.’ Our consulting business also got a mention. Read the full article here. ScriptPhD.com Editor Jovana J. Grbić was invited to contribute to a Popular Mechanics piece on the science of television series Lost. ScriptPhD.com was named to the April 2010 hotlist by the Writers Guild of America, West for outstanding new media content. Warner Brothers Entertainment tweets ScriptPhD.com’s film review of Hubble IMAX as the official face of the movie! ScriptPhD.com was named by Wired Magazine’s Geek Dad blog as one of 168 Geeky Media People You Should Follow on Twitter. Follow us on Twitter here. Editor Jovana J. Grbić gave a lecture at UCLA Film School entitled “Science, Entertainment, and a Digital World.” See the slideshow here. -Ernesto Robles, author of The Malthusian Catastrophe, which ScriptPhD.com was among the first to cover in a post entitled Forever Young: Living in an Age of Agelessness. –Dr. Andre Fenton, Professor of Physiology and Pharmacology, SUNY Health Science Center at Brooklyn, regarding our post, Eternal Sunshine of the Spotless Mind. -Tenaya Wallace of Donate Life, responding to ScriptPhD.com’s review of CBS’s Three Rivers and discussion of the realities of organ donation. –Dr. Daniel Levitin, Associate Professor of Psychology, Behavioral Neuroscience, and Music at McGill University (Montreal, Quebec) and author of the smash #1 best-seller This Is Your Brain On Music, referring to the ScriptPhD.com review of “The Music Instinct”, an award-winning documentary that he co-hosted.